The Boeing Classic golf tournament brought an unusual benefit to the people of the Snoqualmie Valley this year. It was more than 3,000 pounds of food that included cheese, fresh vegetables, prepared sandwiches, condiments and bread. The extra food came from the catering for the Boeing Classic. 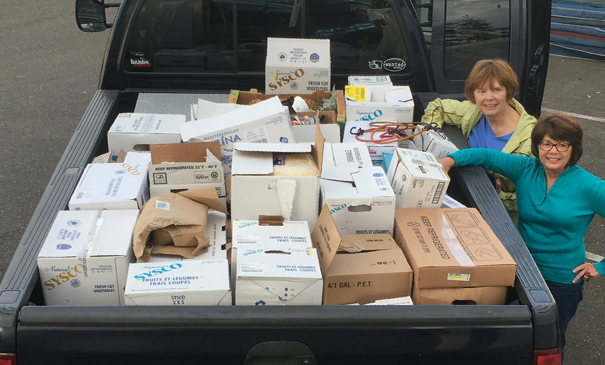 Heidi Dukich, Executive Director of the Snoqualmie Valley Food Bank, came up with the idea of seeing if the Boeing Classic could provide any unused food to the food bank. She asked her board members if they had any connections to the event. Dr. Sharon Augenstein, president of the Snoqualmie Valley Food Bank Board had been a volunteer at the Boeing Classic for years with her husband, and they are long-time supporters of Virginia Mason. For more information, about the Boeing Classic visit BoeingClassic.com. For more information about the food bank visit snoqualmievalleyfoodbank.org.